We can easily imagine a best friend getting married and supporting their special moment with happiness and fun. That's why the central characters click in our minds easily - Kabir (starring Abhay Deol) who's easy going, fun and caring about others around him; Imran, (starring Farhan Akhtar) who loves to flirt, woo and show off his down to earth attitude and his sense of humor at the right time and at the right occasion and yes, Arjun, (Hrithik Roshan) who appears to have it all because of the money he flaunts and yet he is the poorest among them all because he forgot to find happiness through the simple things that make up life. With Kabir all set to marry Natasha (starring Kalki Koechlin), the guys go for their 'bachelor trip' and the rule of the game is that each one gets a chance to try out an adventure sport of their choice and the choice will remain a secret till they reach the spot. You can sit back and simply enjoy the brilliant visuals of Spain, its culture and its heady romance with colorful festivities. 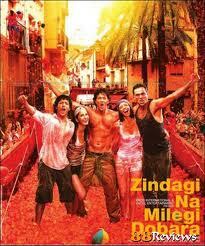 They meet the lovely Laila (starring Katrina Kaif) and the romance sets in smoothly. She delivers the 'message' of the movie subtly. That happiness is not about working 24X7 to plan for one's retirement but it's about choosing your attitude to life and living fully in the present instead of stashing away and slaving for hours in anticipation of tomorrow. She convinces Arjun that by living fully in the present, you enjoy to every breath and savor it to the fullest. That, she reminds him, as important as letting go of the past and cutting the ties of insecurities that bind. Katrina Kaif has blended in with the character she represents & done it delightfully right down to the bold kiss. What resonates most is the deep friendship between the characters, with all its undercurrents and high moments. You can sense tension in the air when one friend's expensive mobile is tossed aside in what was meant to be a fun filled gesture and when one friend asks the other if he is truly happy with the girl that he's getting ready to marry. The tomato festival and the 'Bagwati' character, I really enjoyed. The 'Diamond biscuit' rendering and the 'Doordarshan' humming - Zoya Akhtar definitely got it right because that's exactly the kind of memorable conversations that best friends enjoy while chilling out. There's a lot more to this movie than that, of course. You know what I loved the most? I could see a slice of my college life & I simply didn't want the movie to end. My favorite character was that of Farhan Akhtar's - I think he was the best because he was the most natural and seemed perfect in the character he represented. 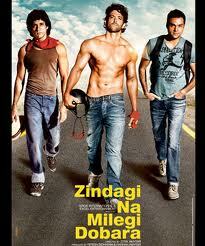 Watch Zindagi Na Milegi Do Bara - it's worth your time and money. I too read good reviews. It's on my list along with chillar party. Haven't seen it yet but almost everyone is praising it. Will see it soon. Good review. I loved the movie, locations, dialogues, scenes and the actors as wel.. beautifully photographed one i've seen recent days .. Thanks, Tan. Do watch it. Asha, thanks. Do watch it. Adi, my son is after me to watch Chillar party b'coz his friends watched it and told him. Peer pressure in KG! Nitha, glad u loved it. Rachna, you've got to. It's awesome. Being Pramoda, Glad that u loved it too. You said it! Nice review. Farhan Akhtar really is a gem of an actor! Amazing comic timing. @Sugar Cube - I too liked Farhan's humor and sense of timing throughout the movie. @Rebecca - Awesome, that u liked it. When I think of this movie, the first thing that comes to mind is the way Hrithik imitated the Doordarshan intro music. Even in those days I used to wonder "why did they choose such a sad tune?" And of all the places, I saw this movie with friends at Amsterdam ! !